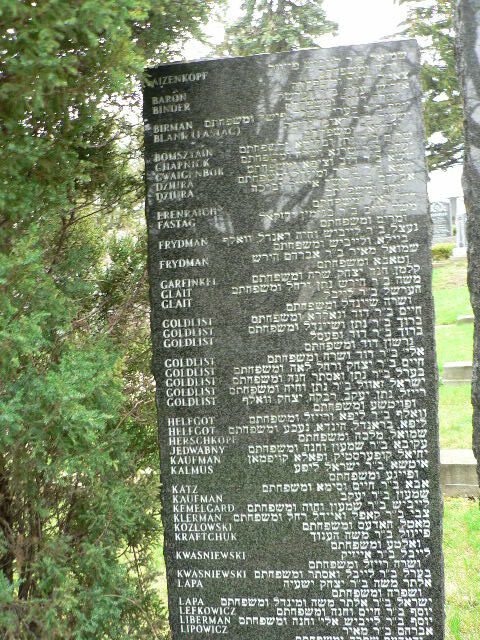 Also see on the preceding page of this exhibition similar photographs of memorials found in the province of Quebec. 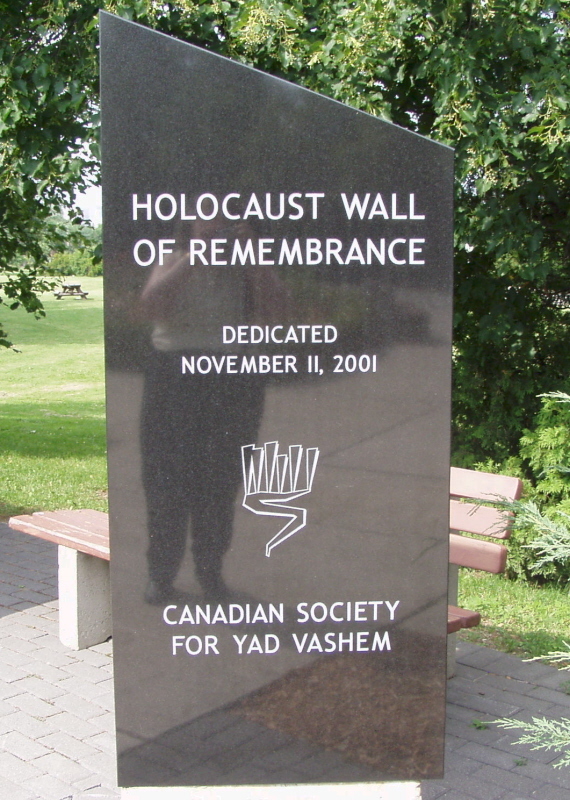 If you have photographs of similar memorials in Canada or elsewhere in the world, please send them to postmaster@museumoffamilyhistory.com . 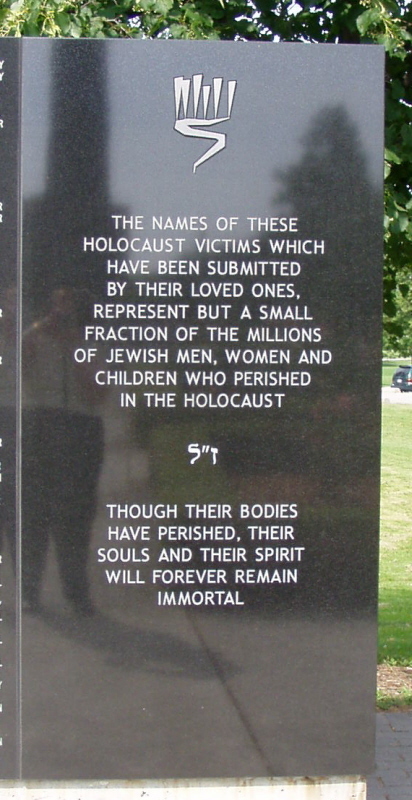 "Dedicated to the six million martyrs of the Holocaust, and in tribute to the Warsaw ghetto heroes and all resistance fighters against Nazism." 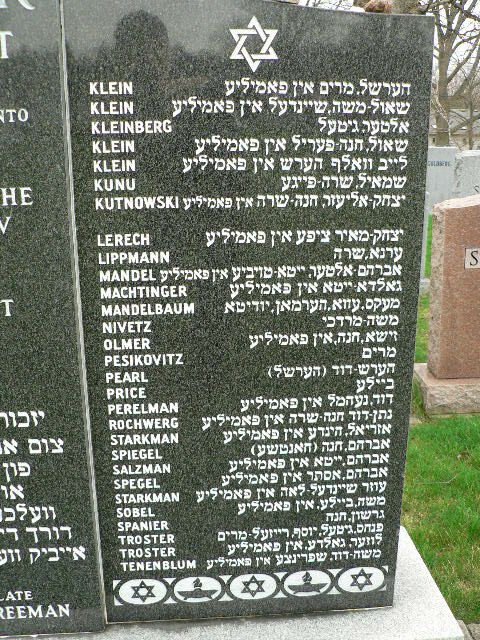 "Unto every person there is a name." 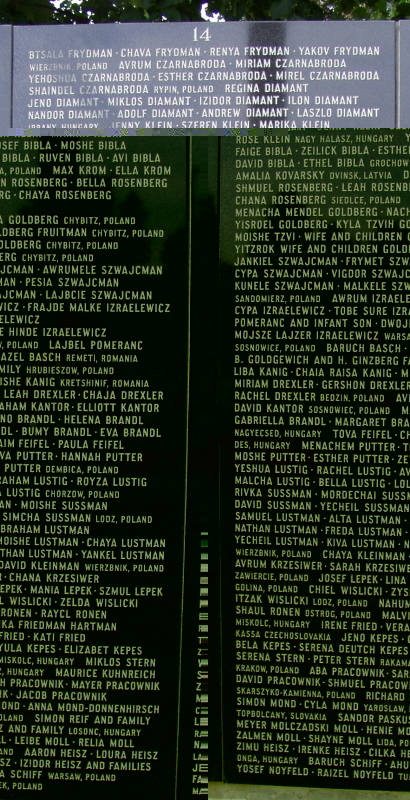 "In memory of the six million innocent Jewish men, women and children who were murdered by the hands of the Nazis." 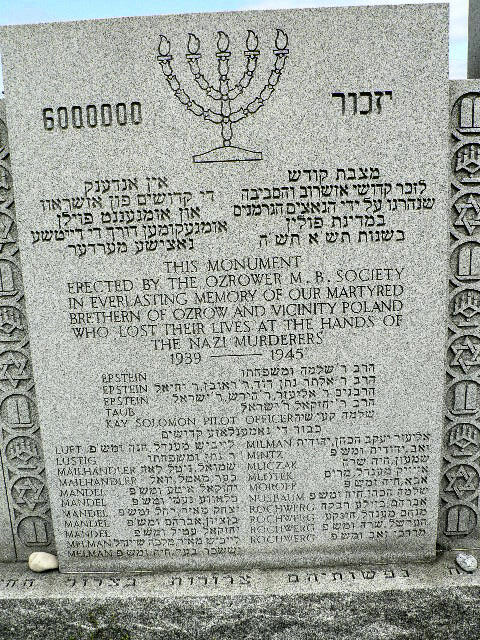 "This monument erected by the Ozrower M.B. 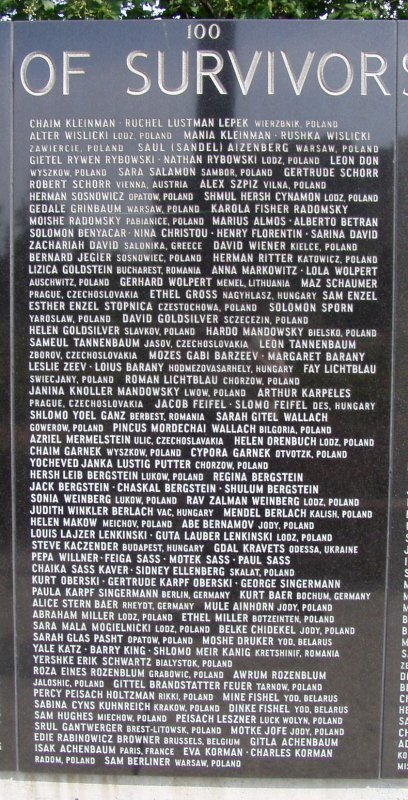 Society in everlasting memory of our martyred brethern of Ozrow and vicinity Poland who lost their lives at the hands of the Nazi murderers 1939-1945." 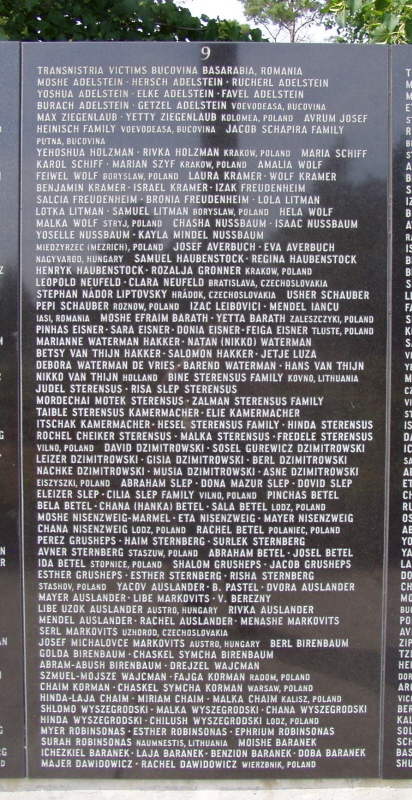 "Dedicated to the memory of our matryred brethern--victims of brutal Nazism." 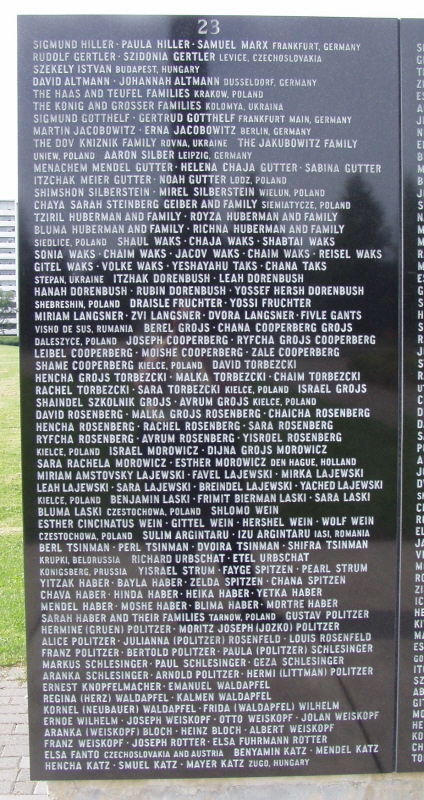 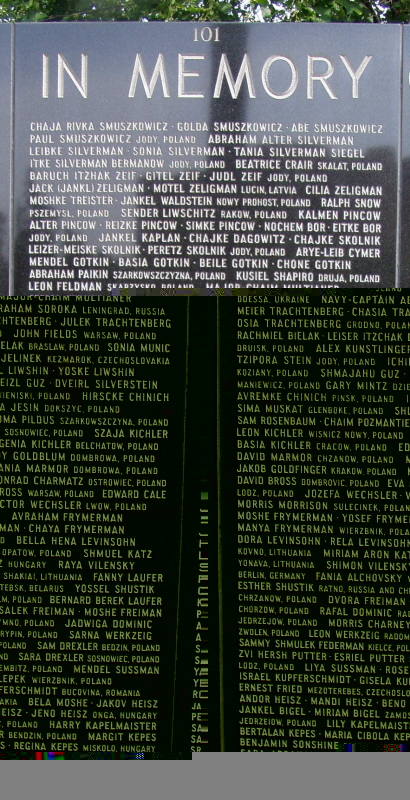 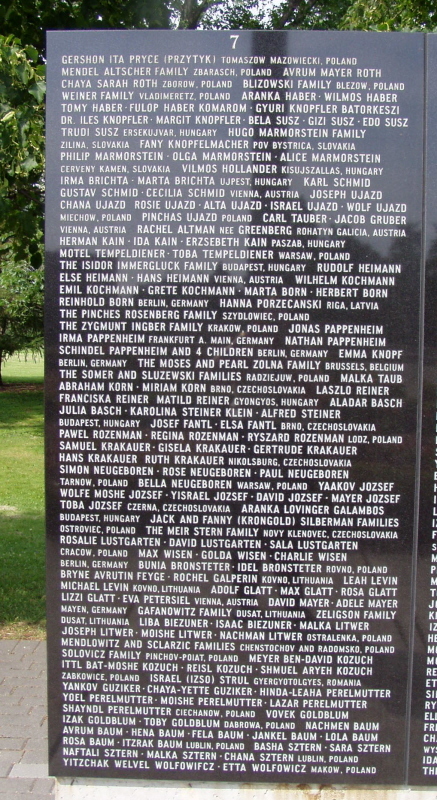 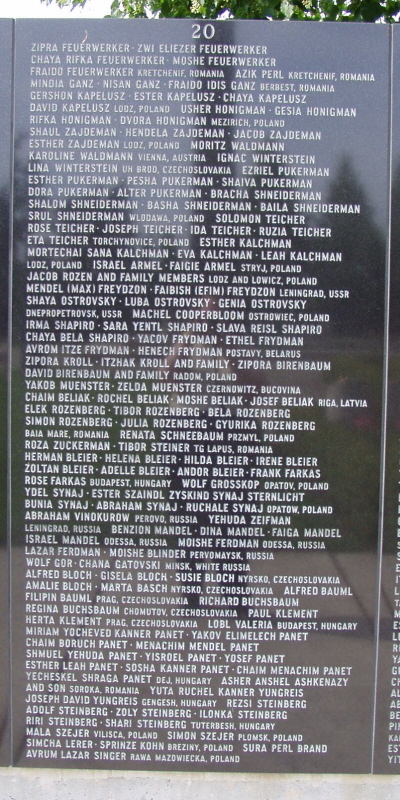 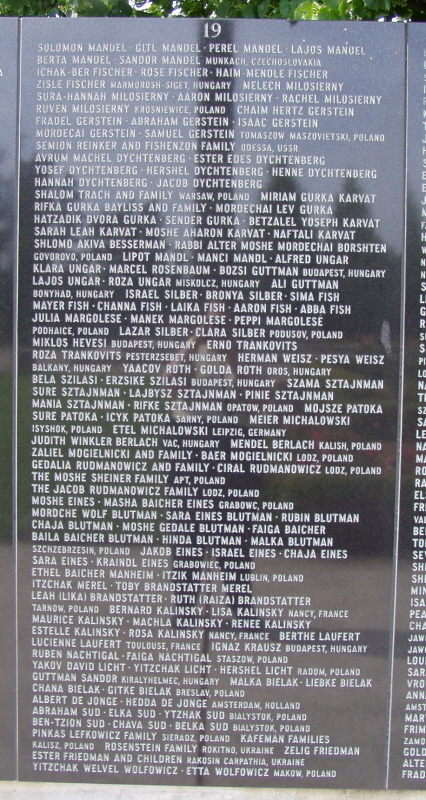 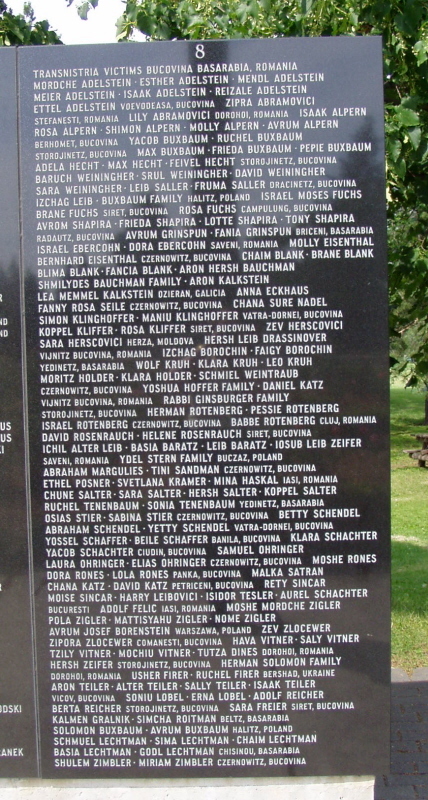 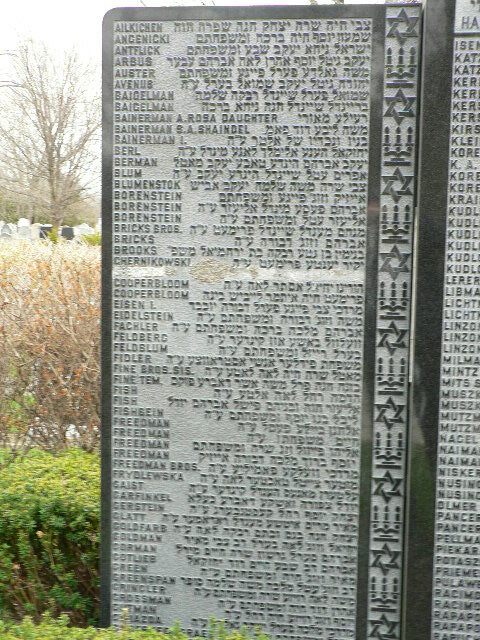 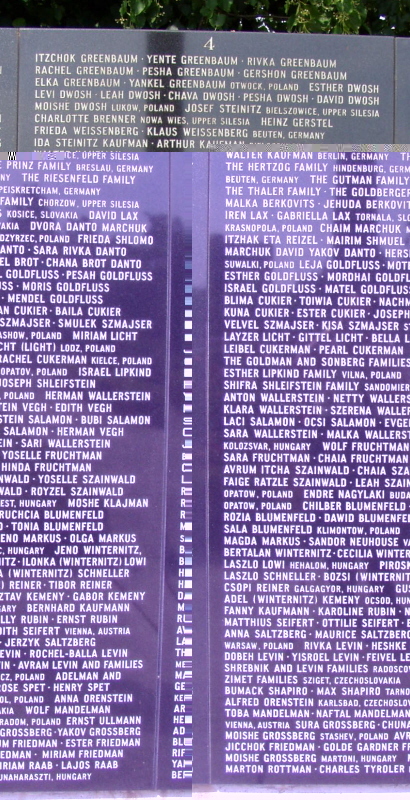 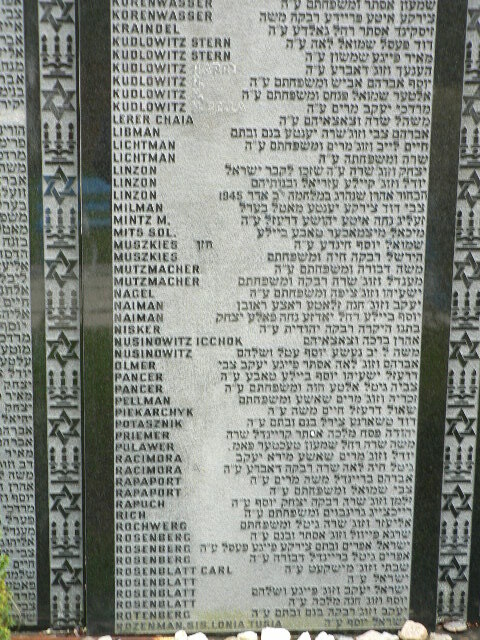 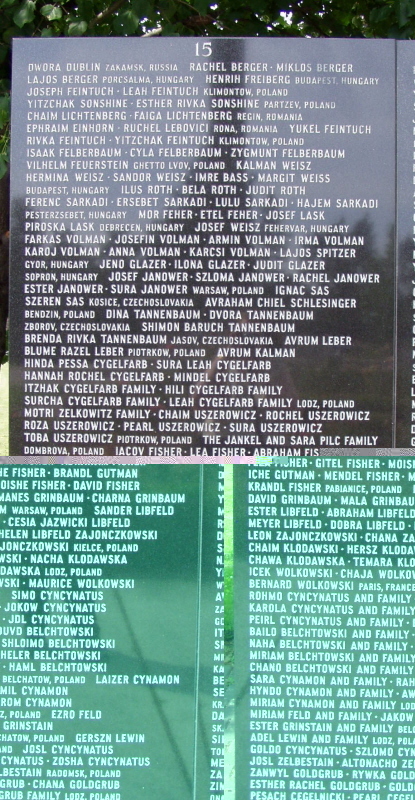 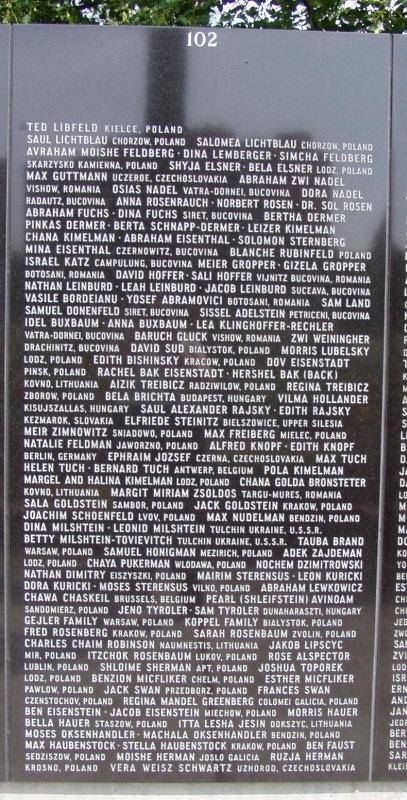 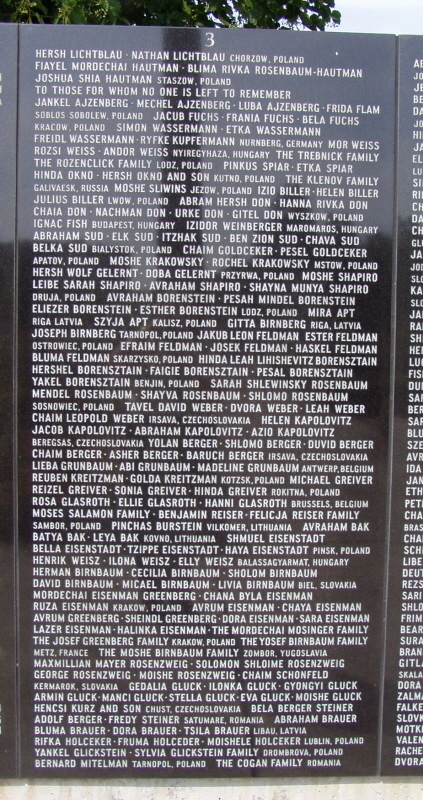 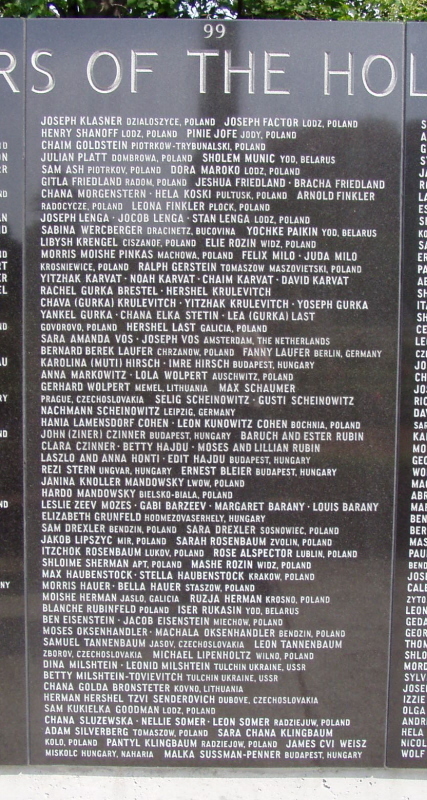 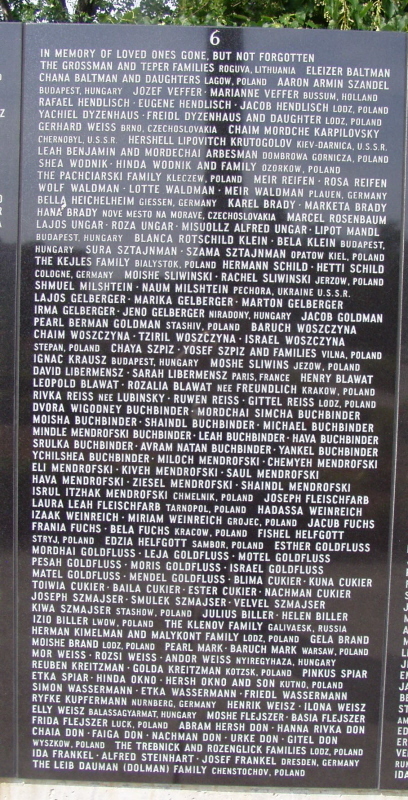 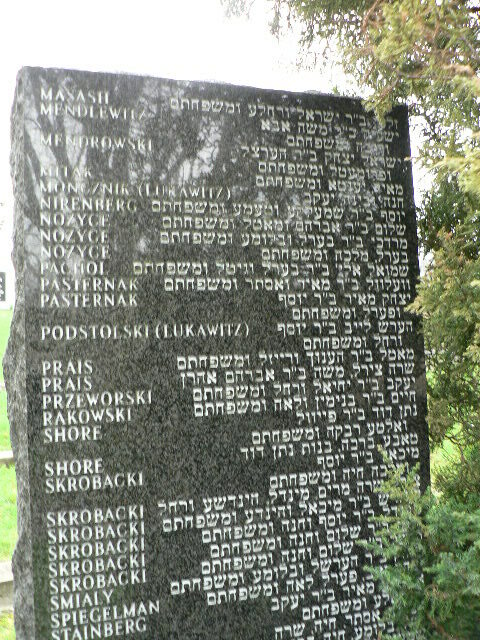 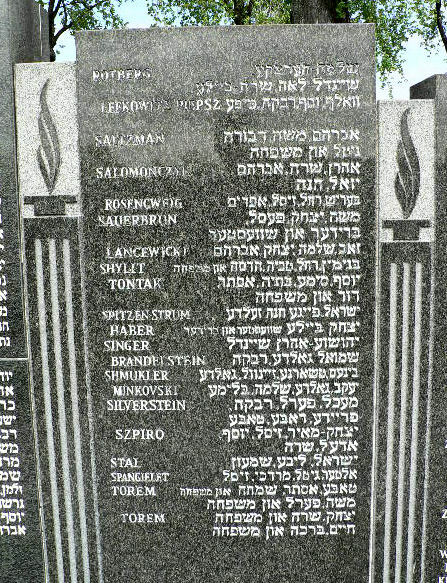 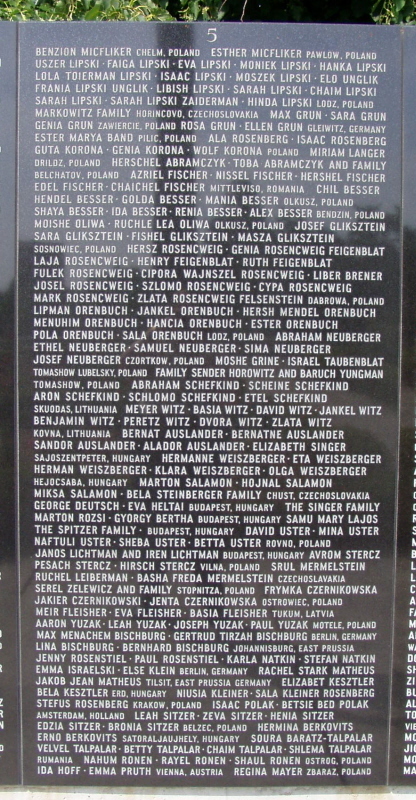 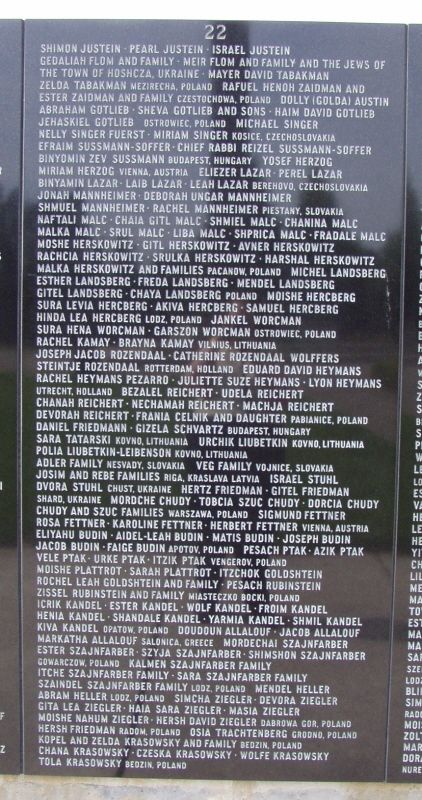 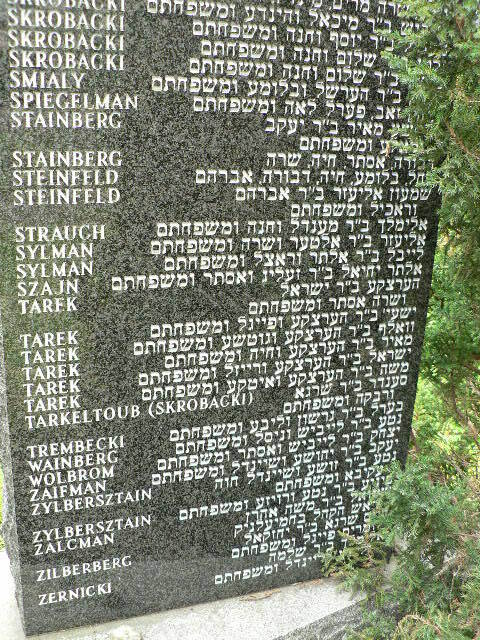 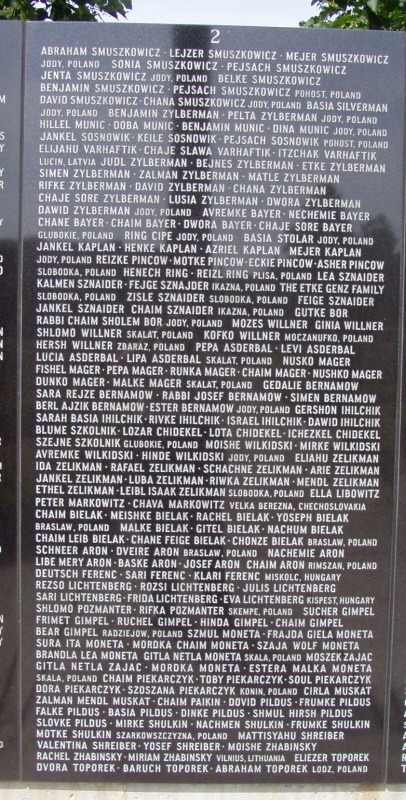 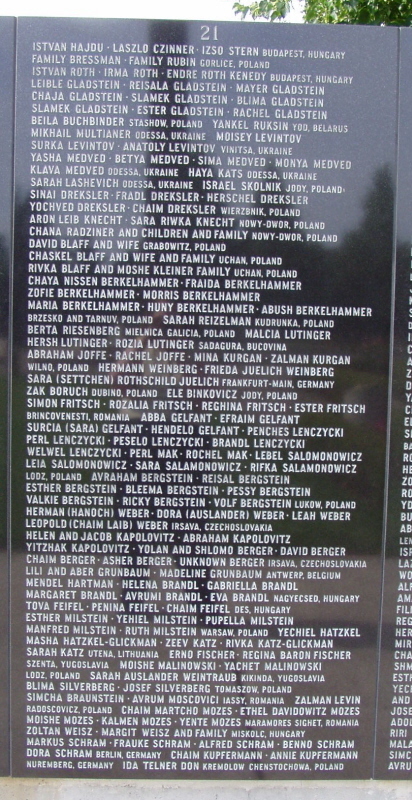 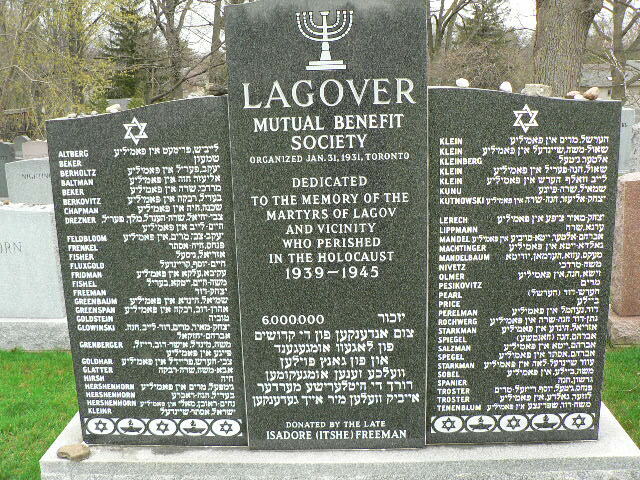 "Dedicated to the memory of the martyrs of Lagov and vicinity who perished in the Holocaust, 1939-1945." 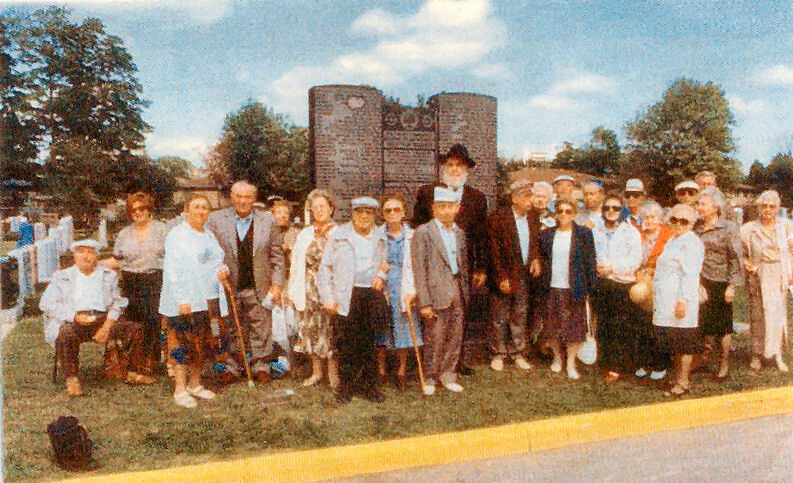 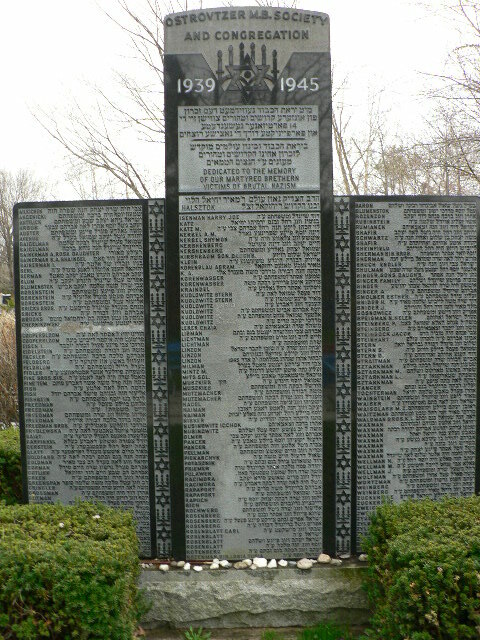 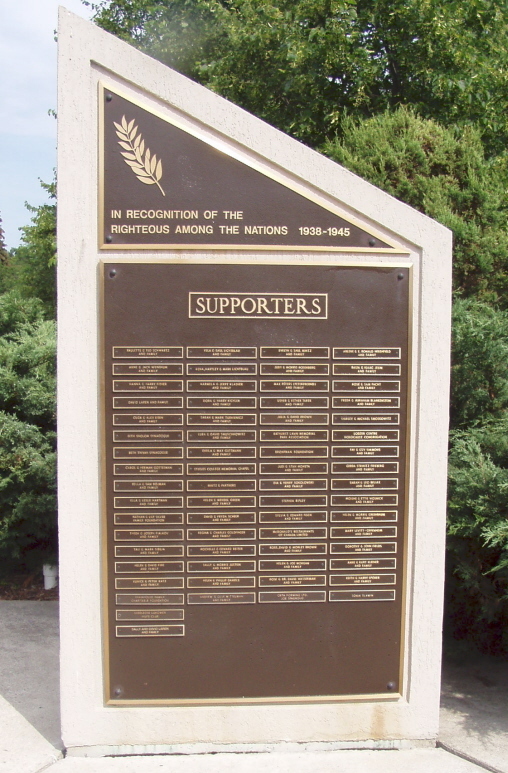 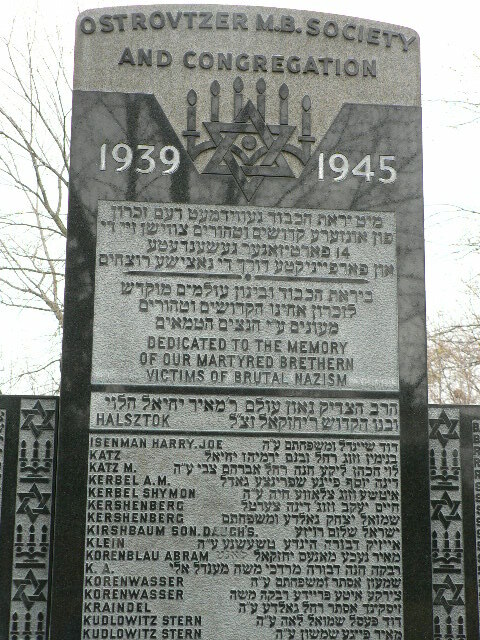 Memorial erected by the members of the Piotrokov, Tomashow, Belchatow and Vicinity Society in Toronto. 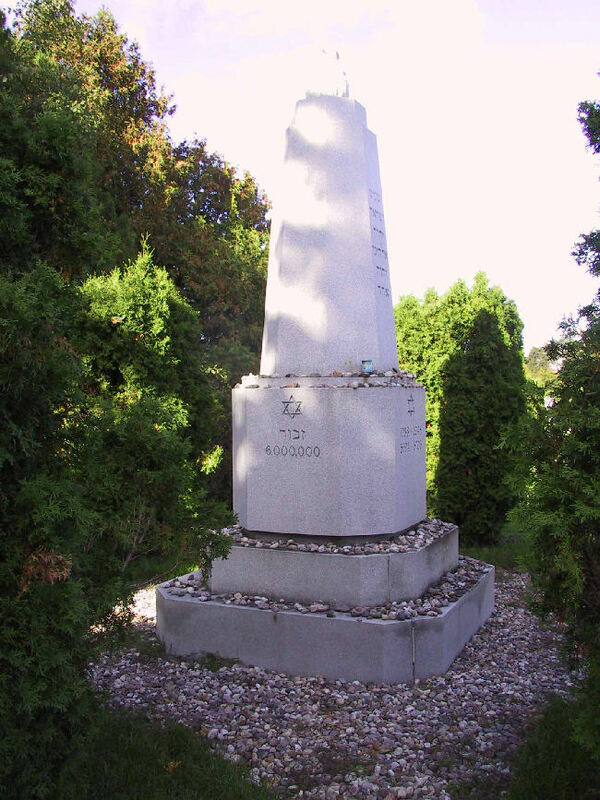 Piotrkov, Tomashov, Belchatov and vicinity 1938-1945. 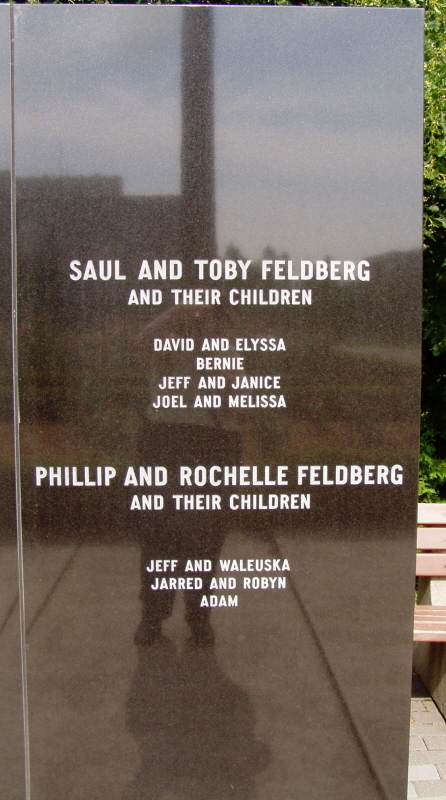 May their souls rest in peace. 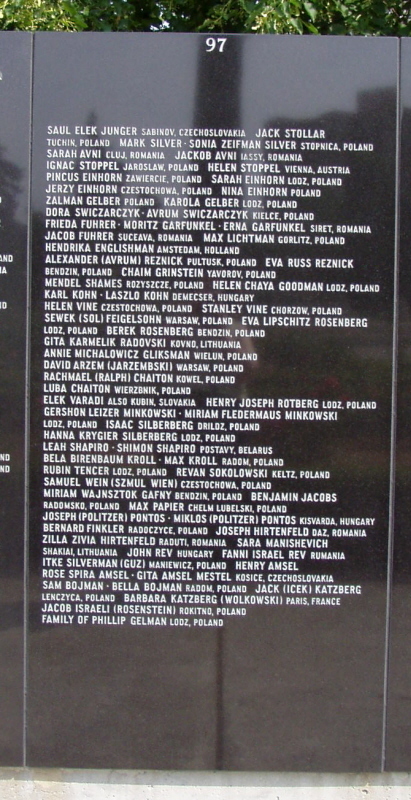 Their memory will live forever. " 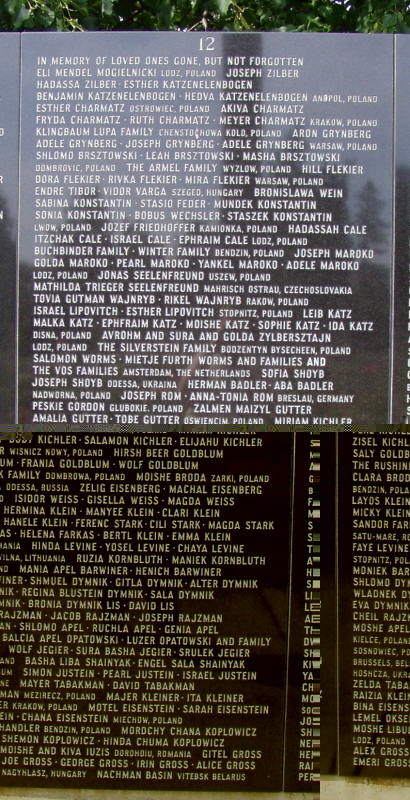 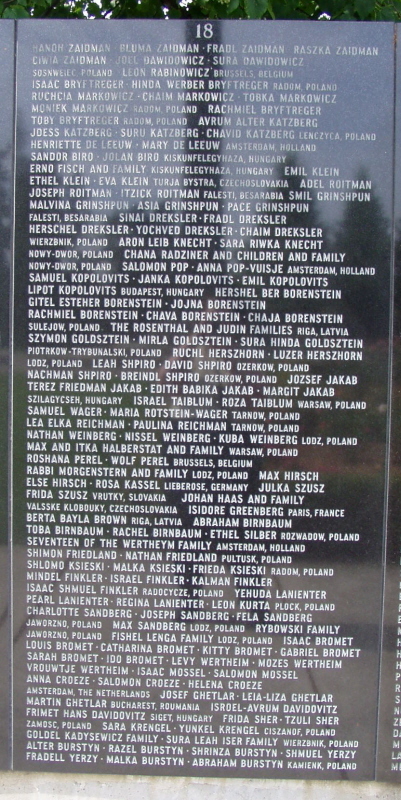 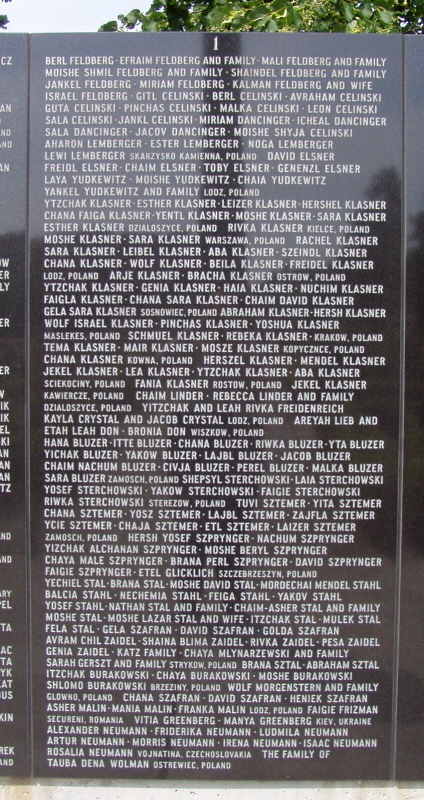 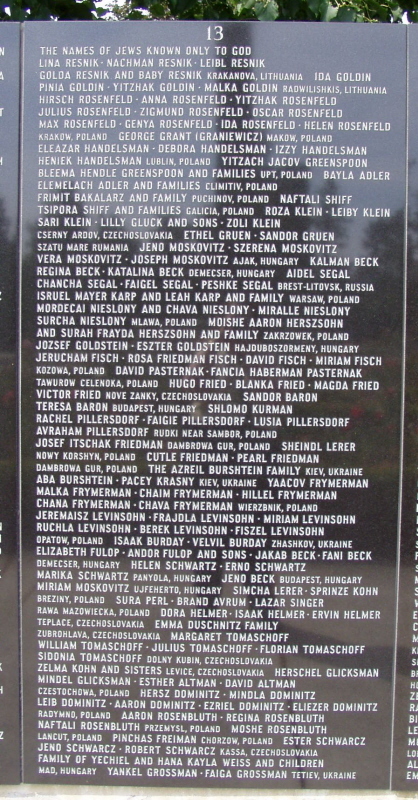 A small black box lies in front of memorial containing ashes of those who perished in Treblinka, 1942. 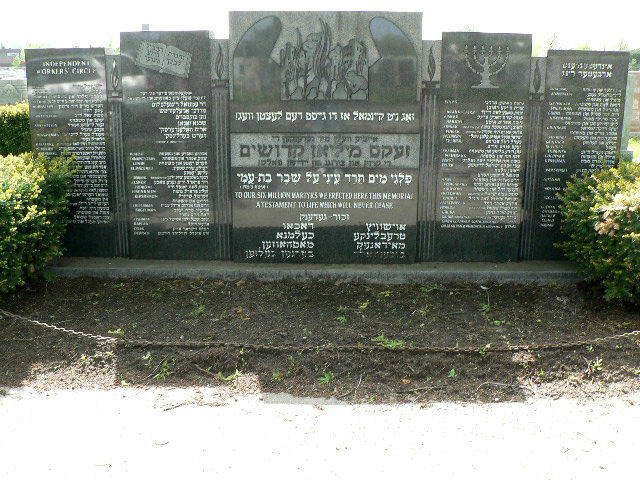 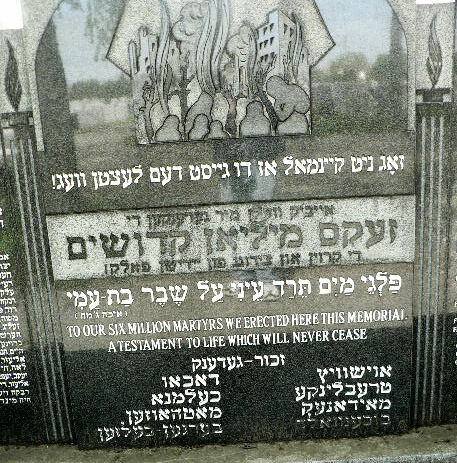 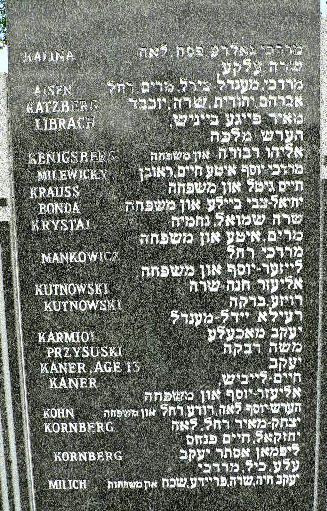 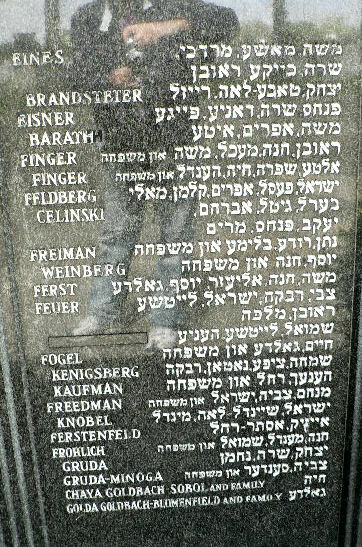 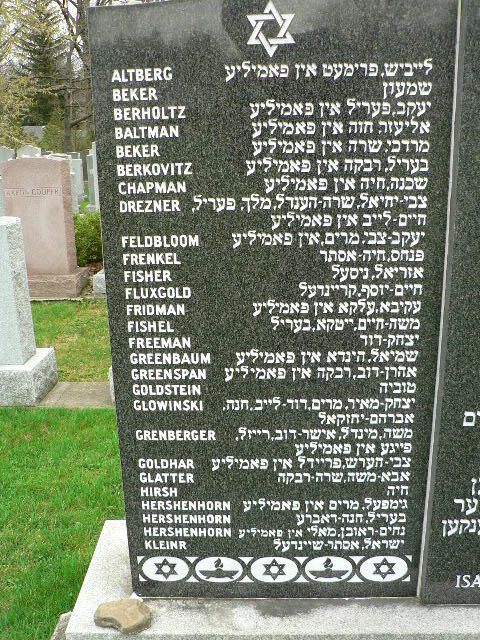 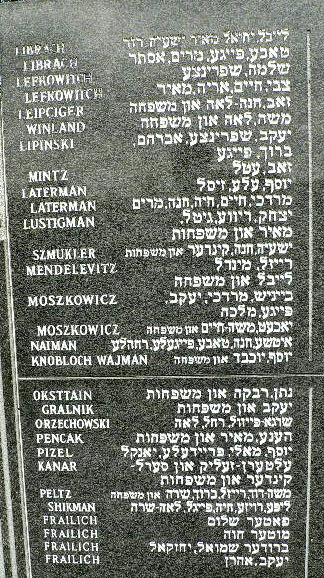 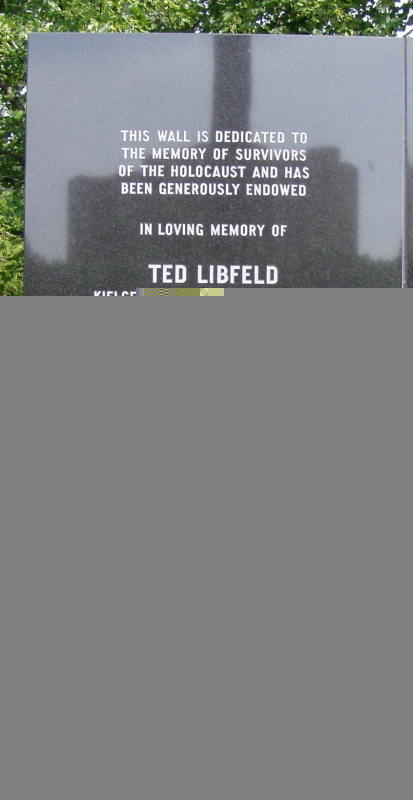 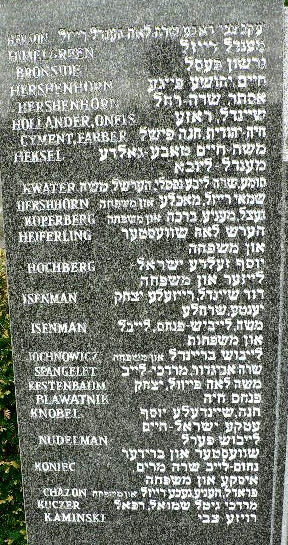 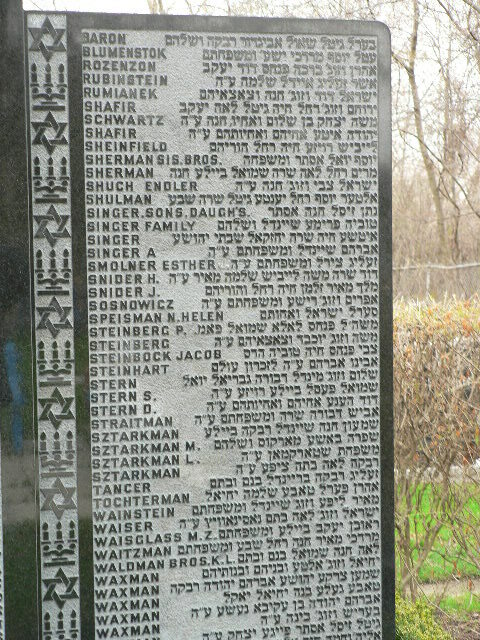 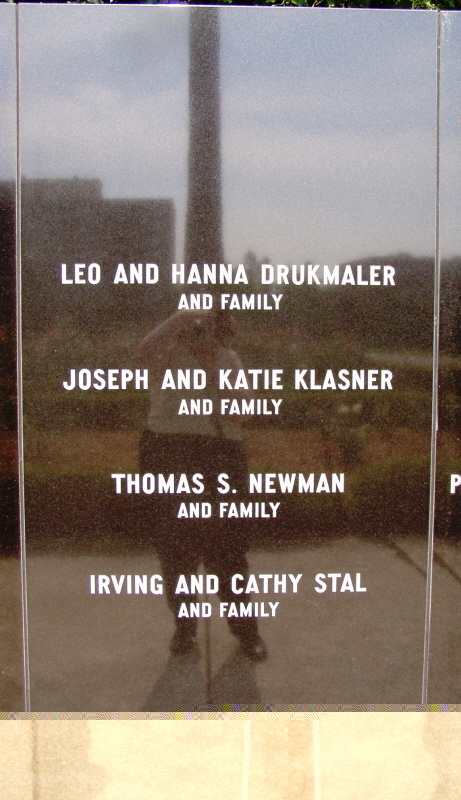 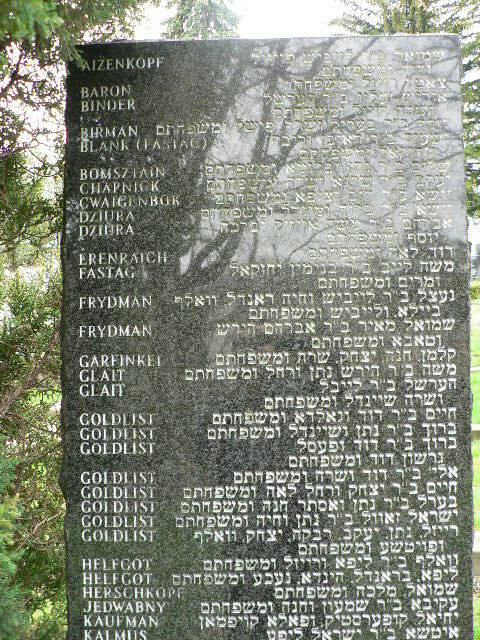 Memorial found in the Minsker Farband/Adath Sholom Synagogue plot. 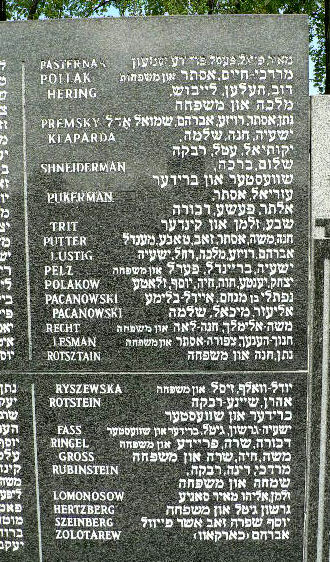 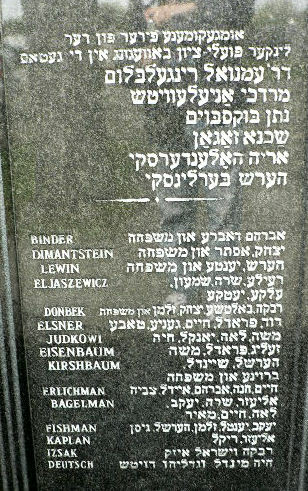 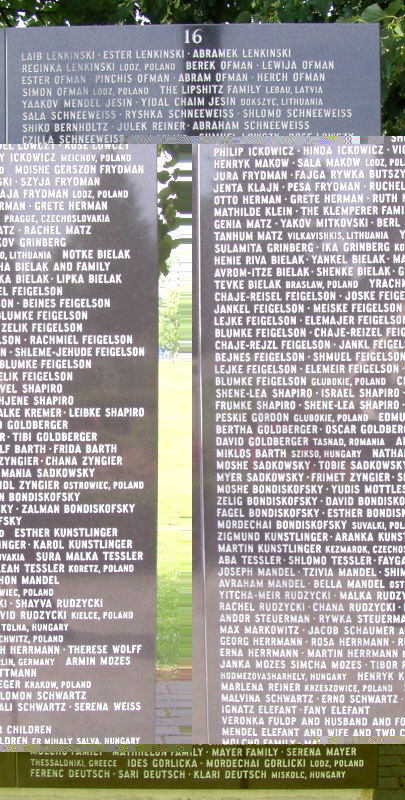 "Dedicated to the eternal memory of all Jewish martyrs..."
"To the eternal memory of my beloved parents, brothers and sisters murdered by the Nazis..."
On two tablets are inscribed family and given names. 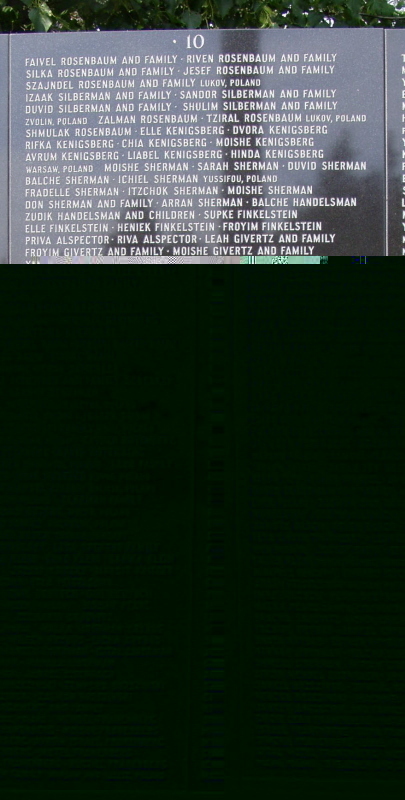 Left-click on the thumbnail photo on the right, then perhaps once again, to see the names enlarged. 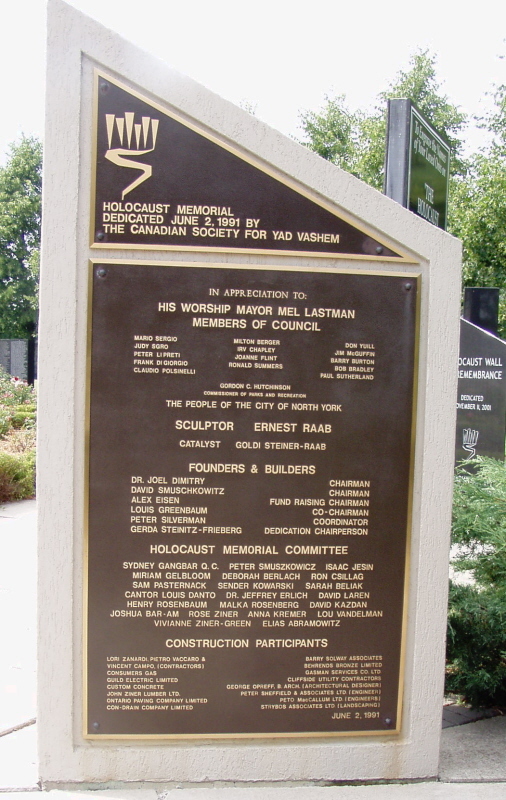 The Vancouver Holocaust Centre Society for Education and Remembrance is located in the Vancouver Jewish Community Centre, #50- 950 W. 41st Avenue, Vancouver BC V5Z 2N7. 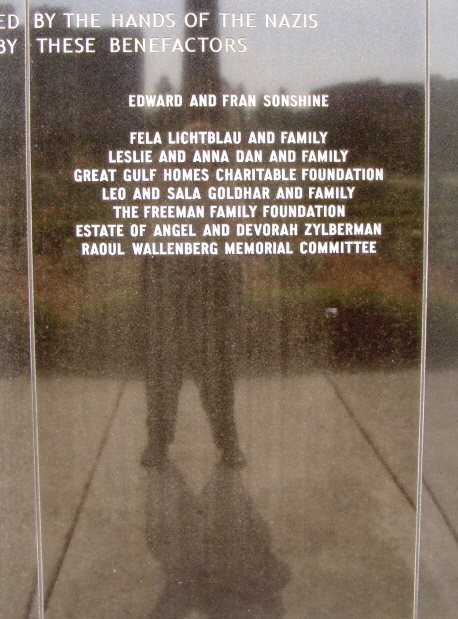 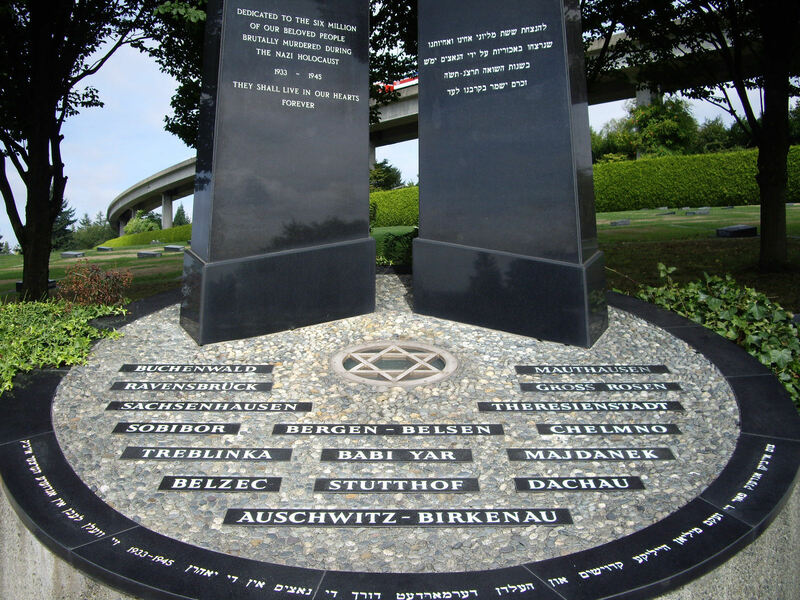 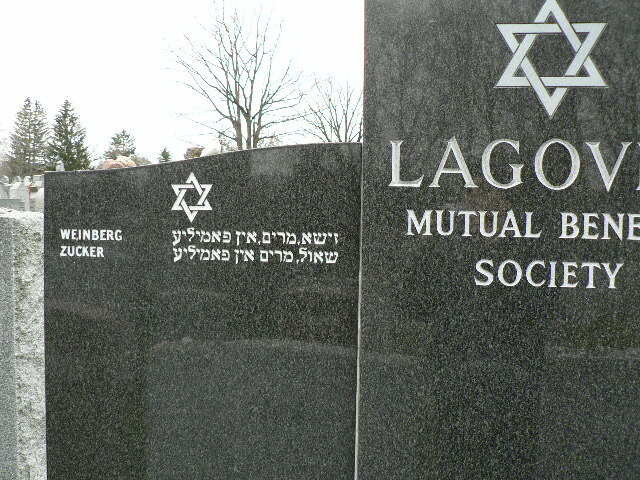 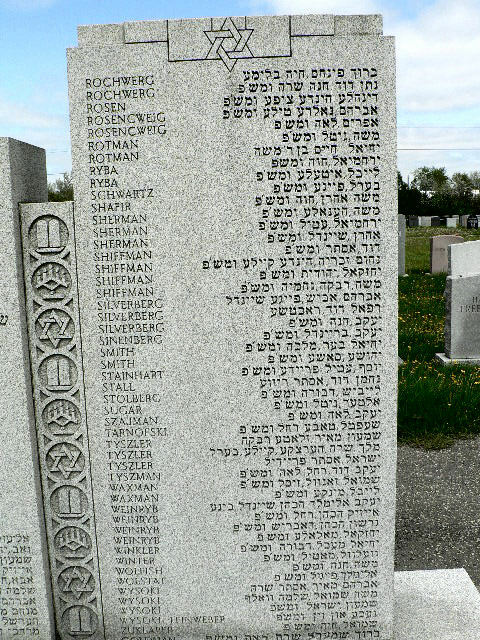 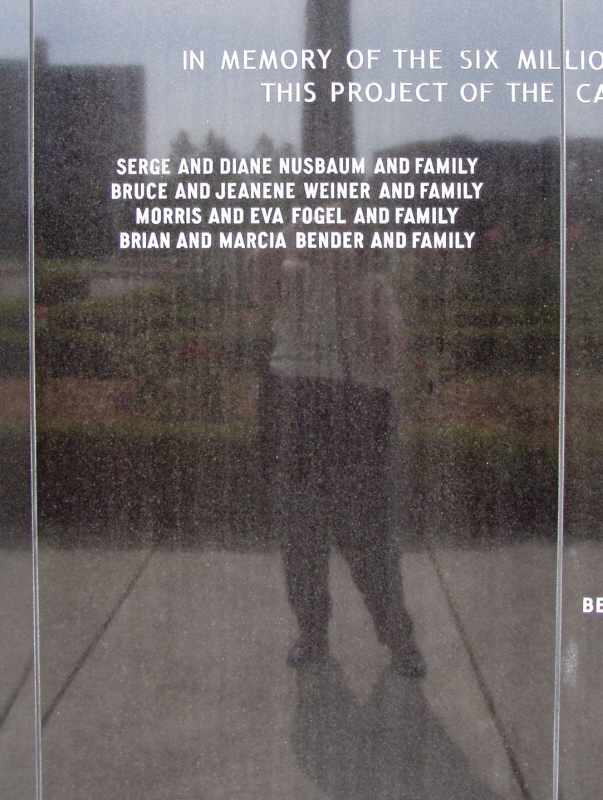 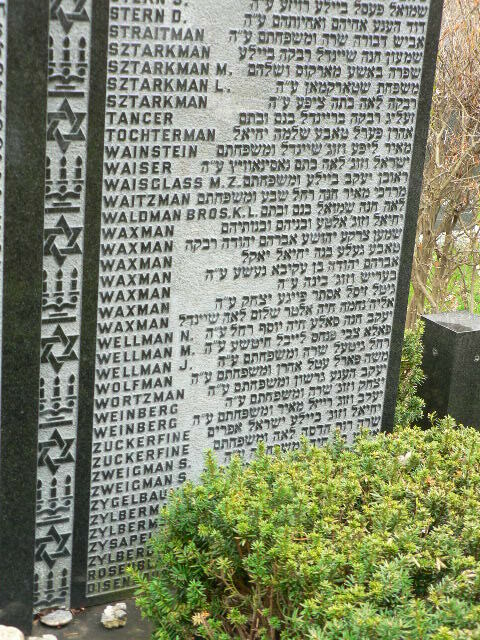 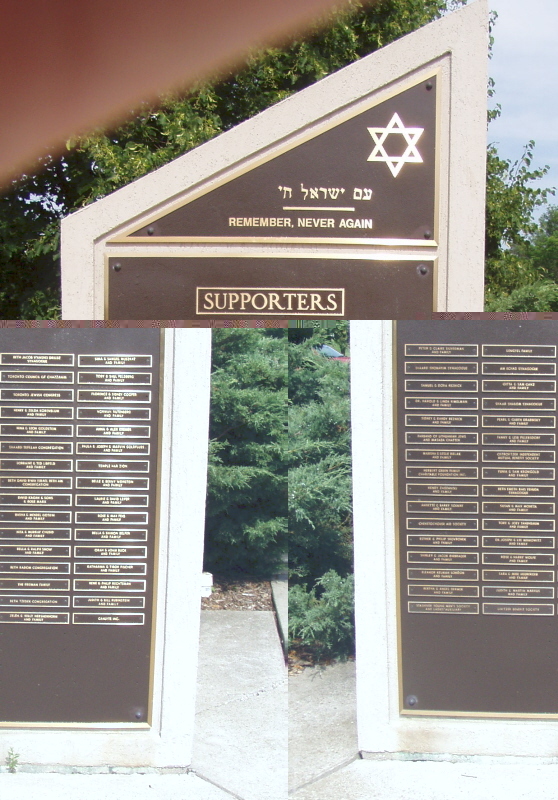 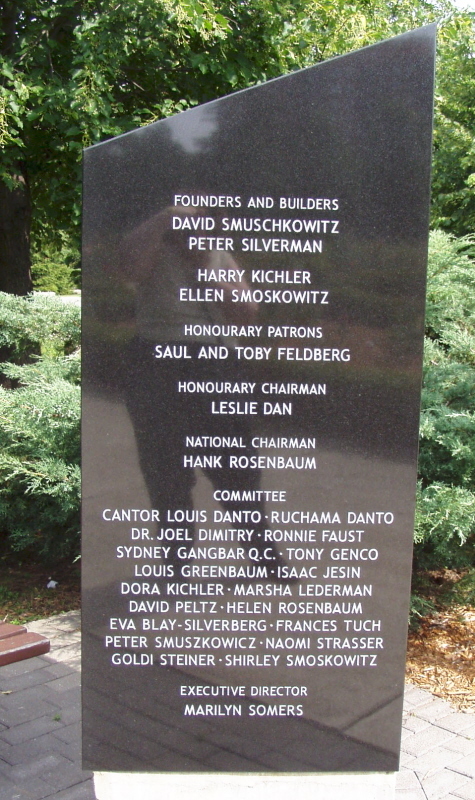 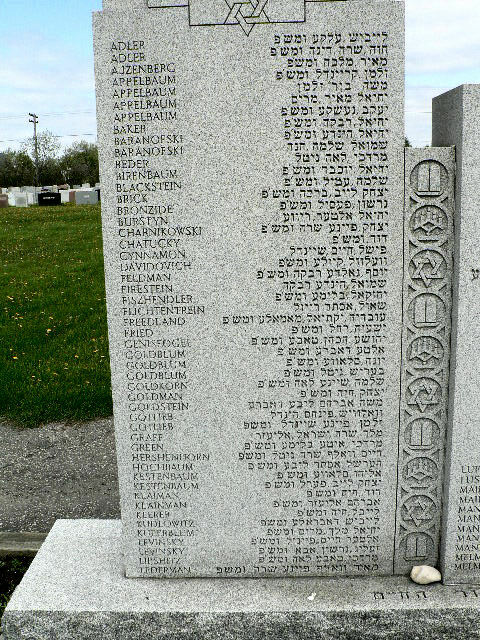 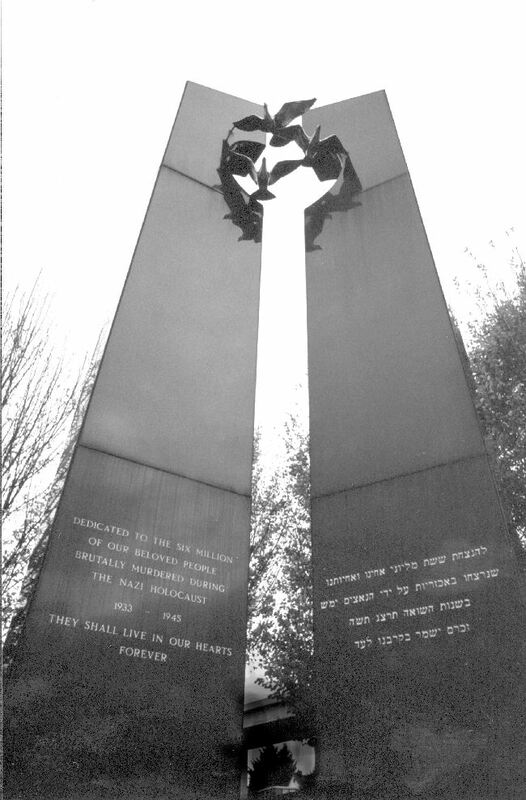 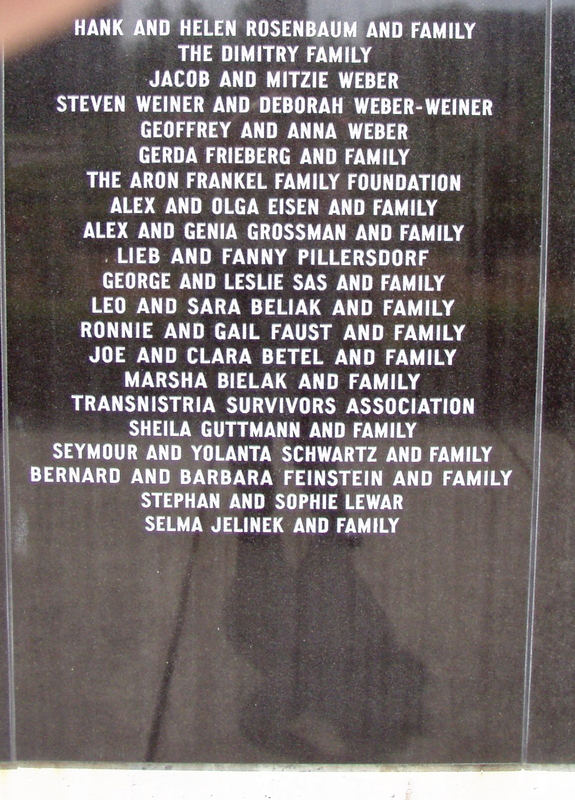 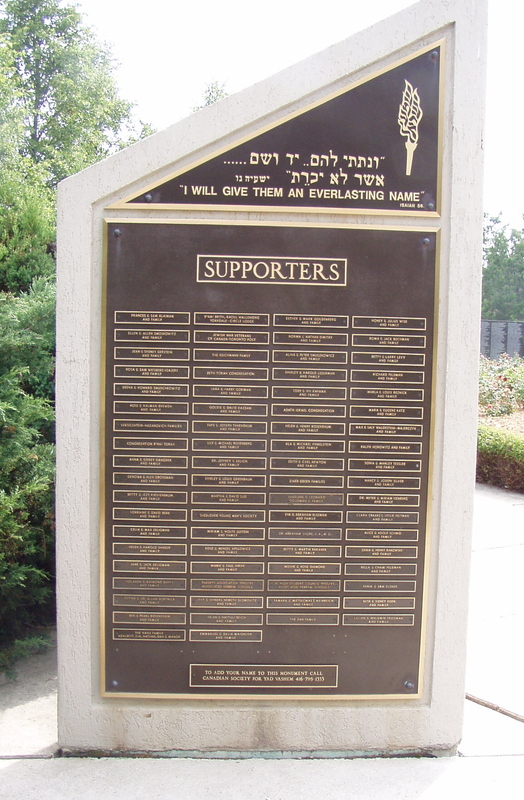 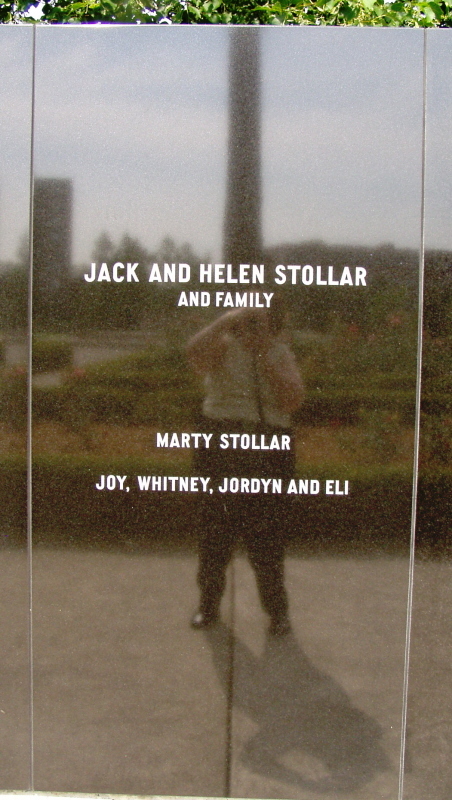 The Vancouver Jewish Community Centre is located in Vancouver, as is the HCS for Education and Remembrance, but the memorial itself is located at the Schara Tzedeck Cemetery in New Westminster. 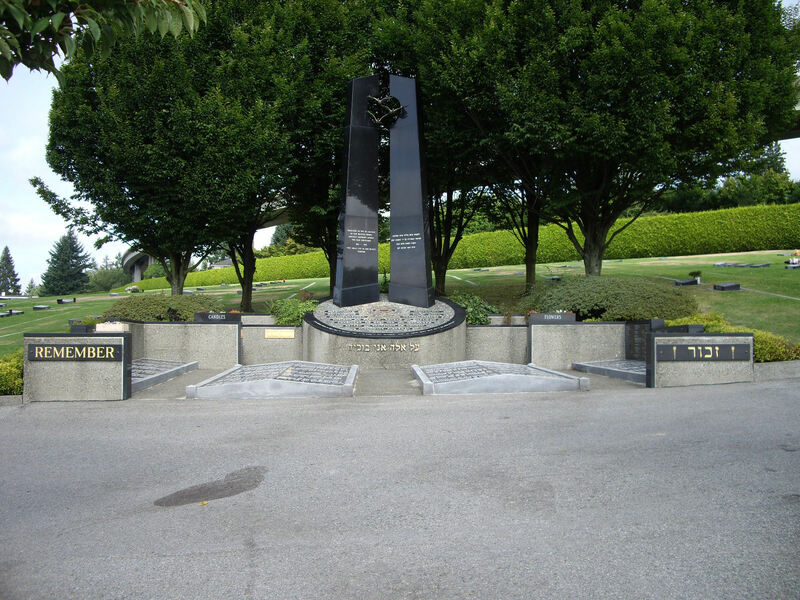 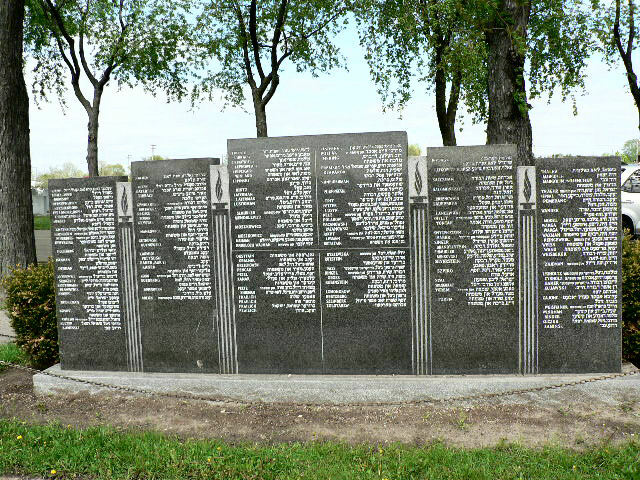 The memorial was built in 1986, making this its twentieth anniversary year. 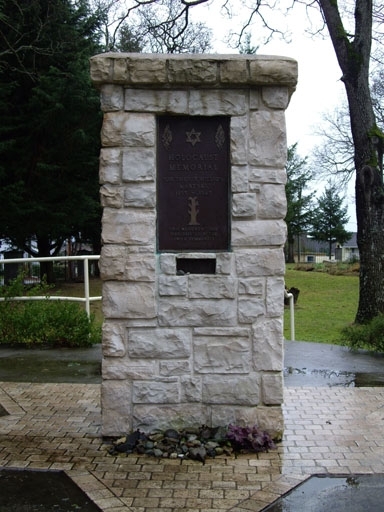 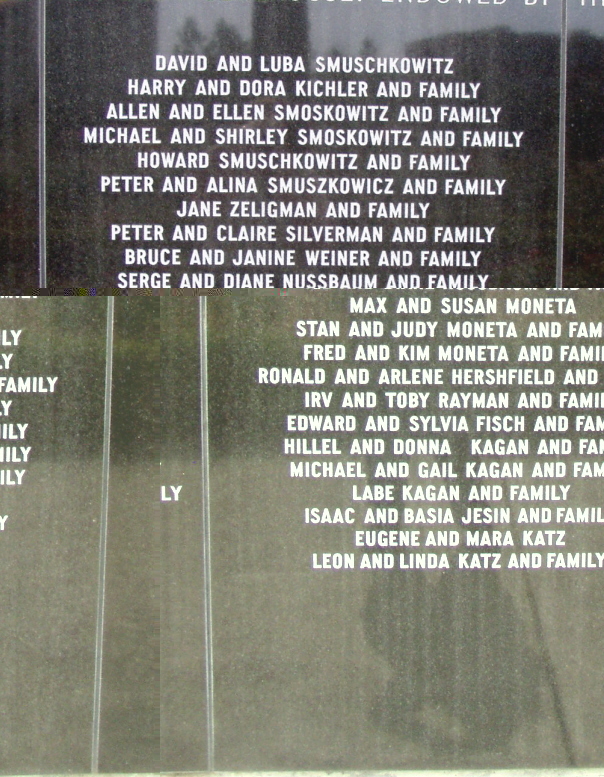 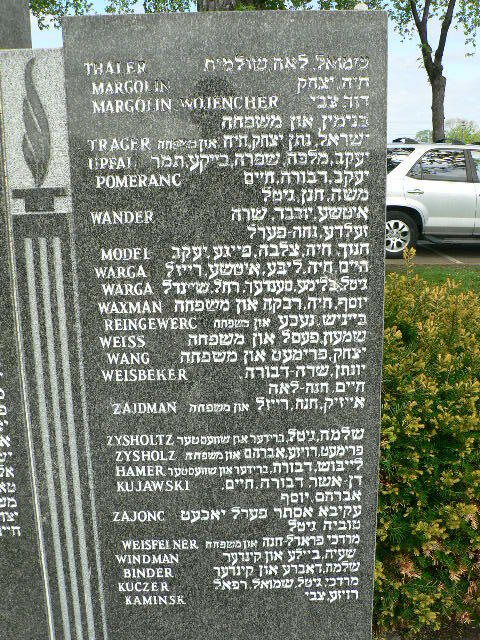 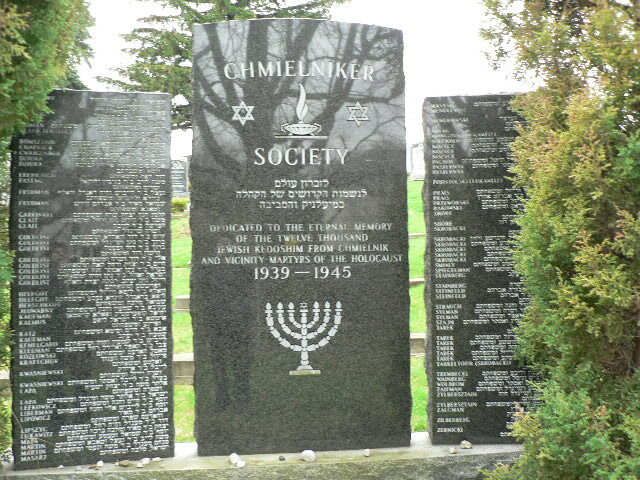 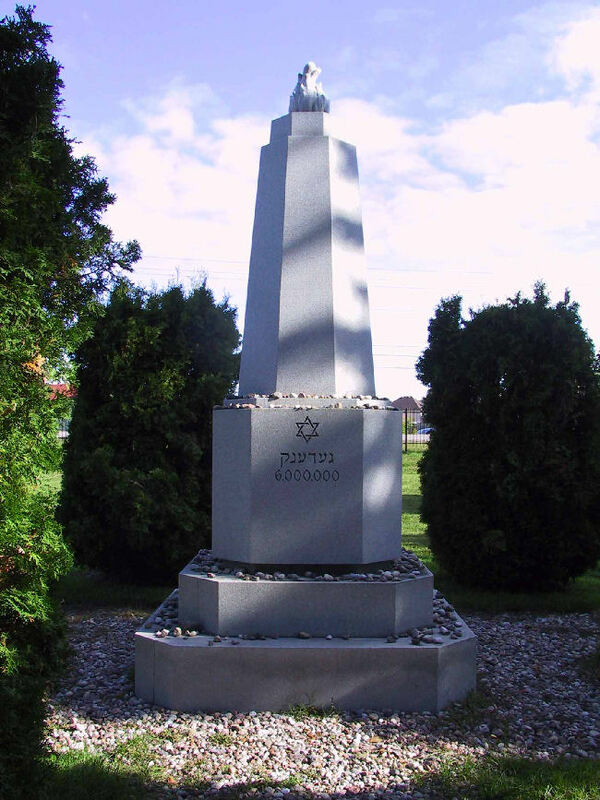 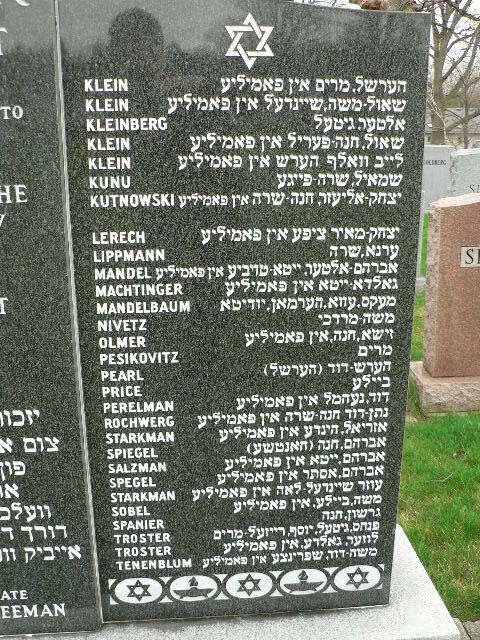 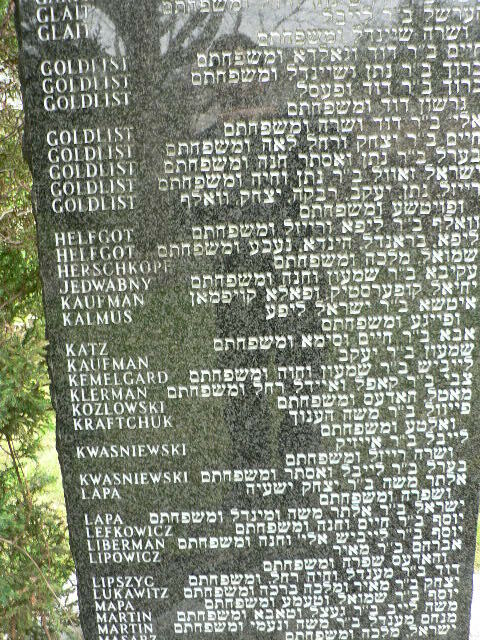 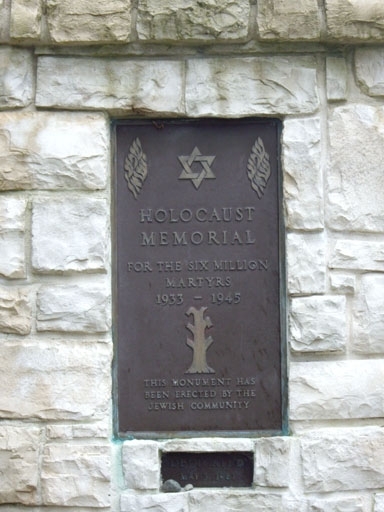 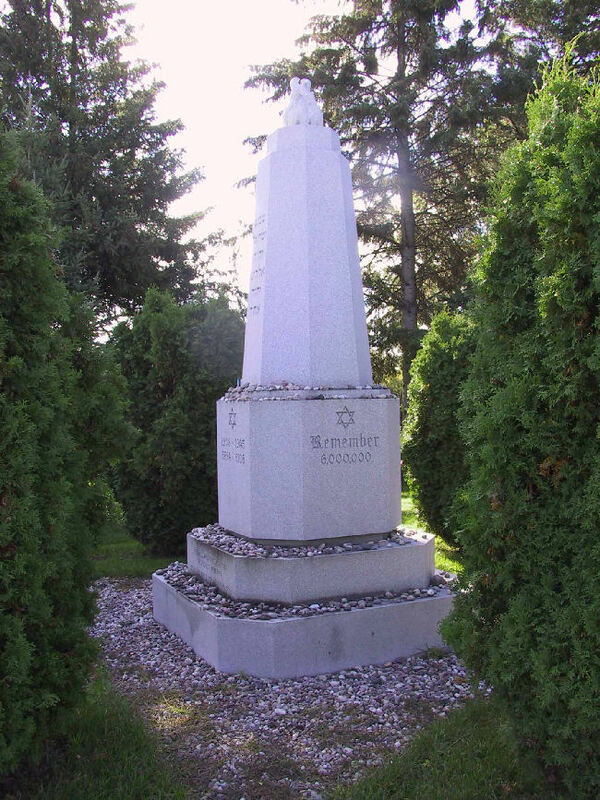 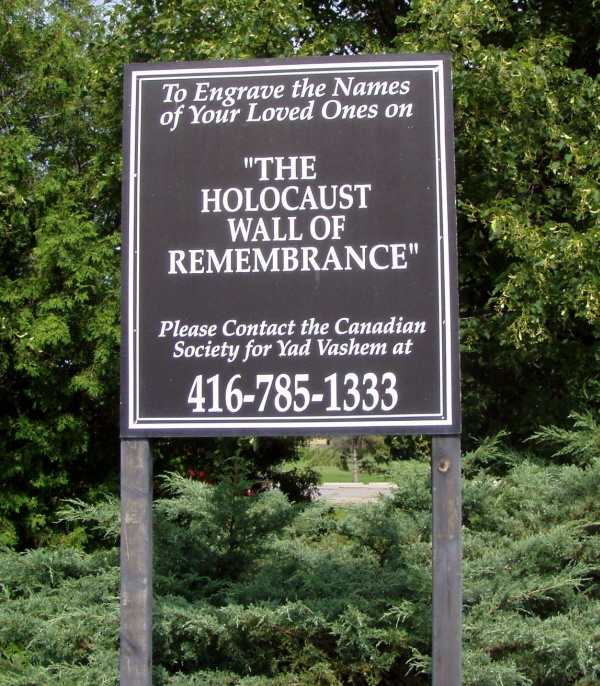 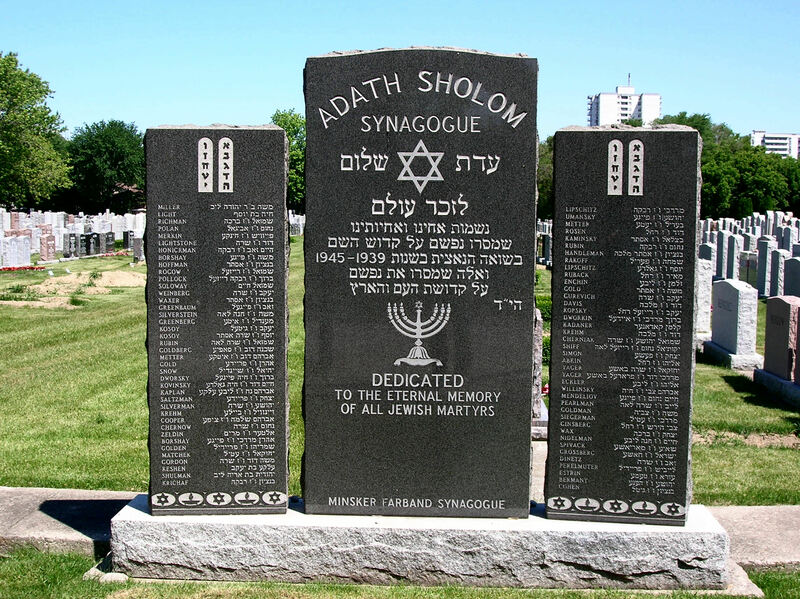 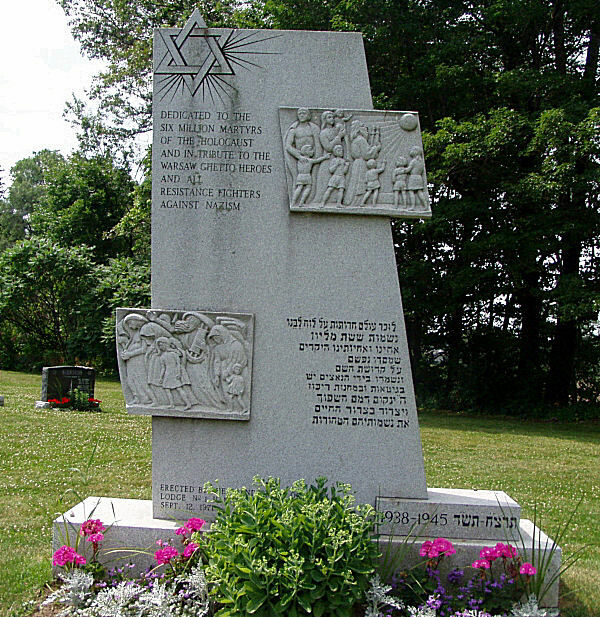 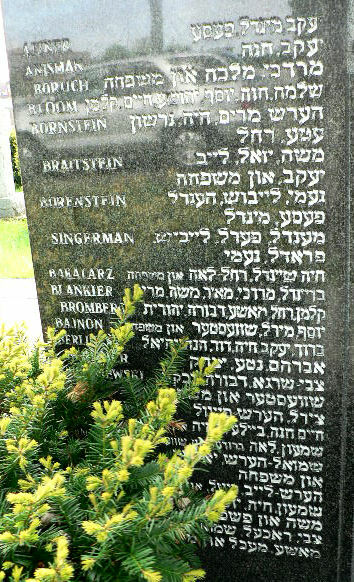 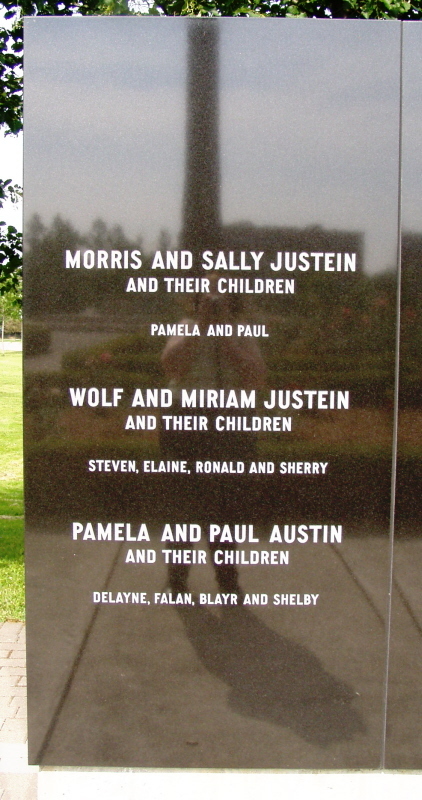 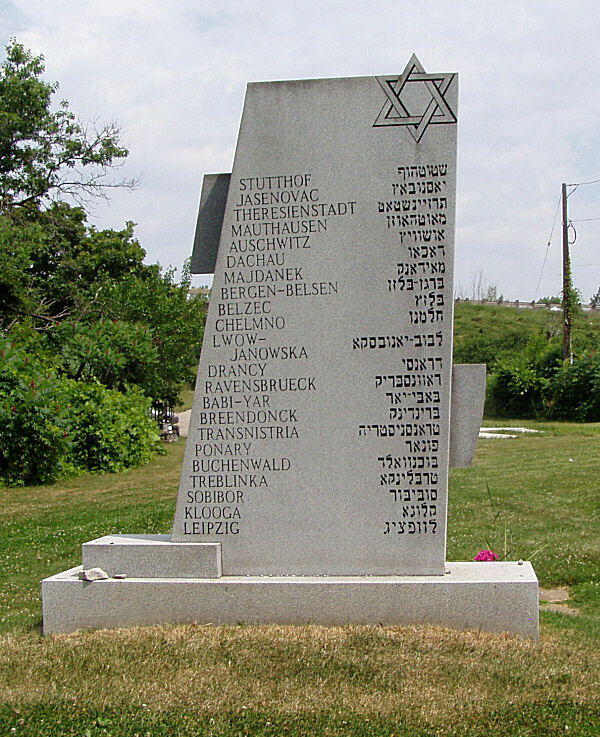 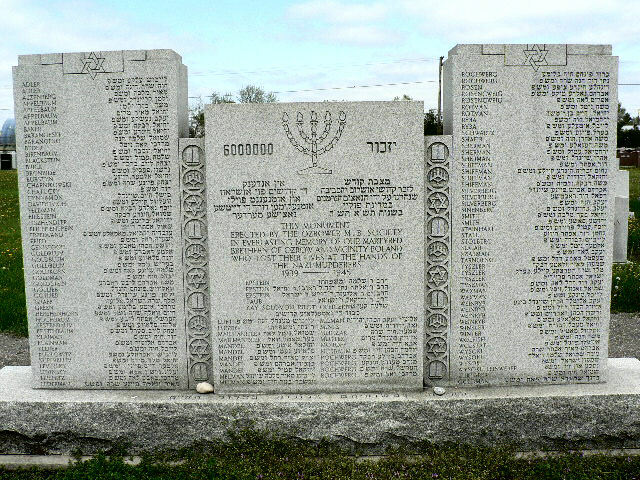 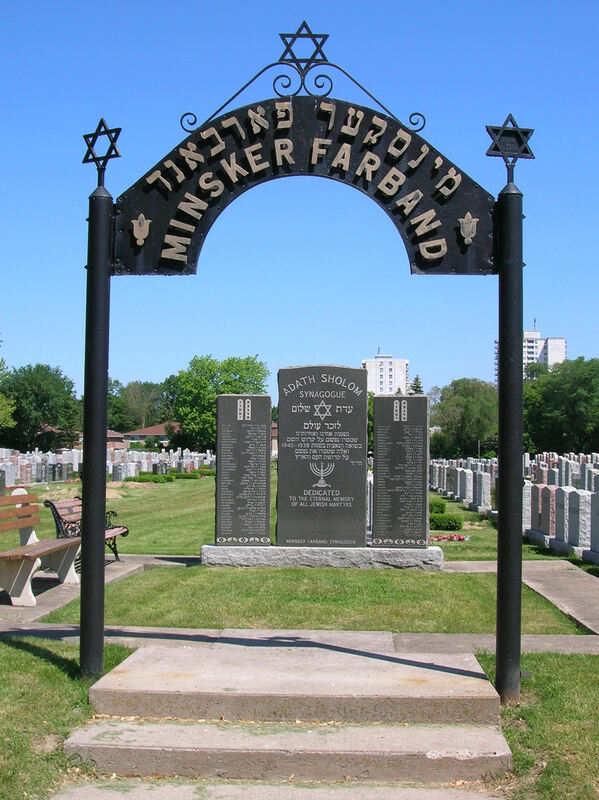 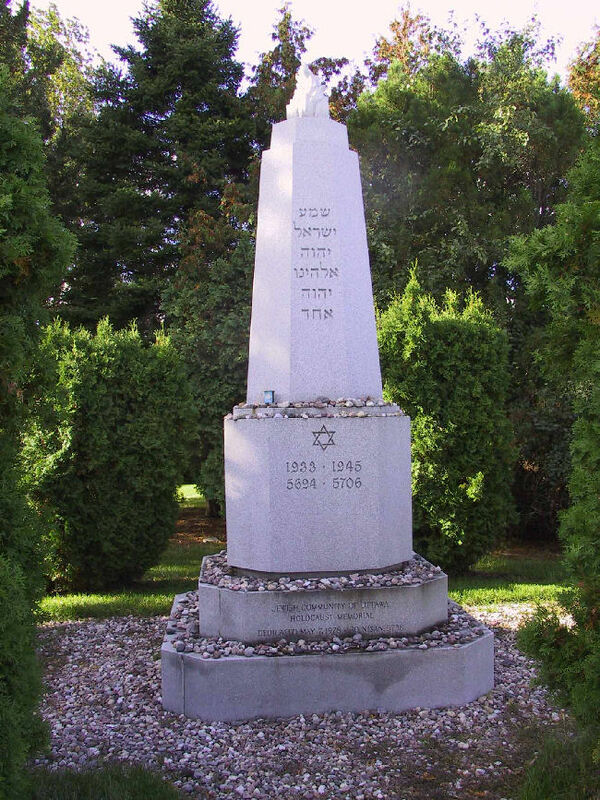 The Jewish community of Victoria erected this memorial inside the grounds of the Congregation Emanu-El Cemetery located on Cedar Hill Road (near Hillside Avenue) in Victoria, British Columbia.